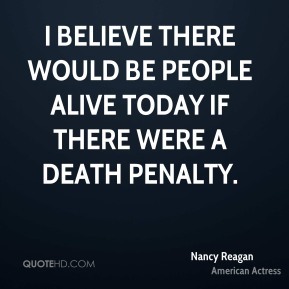 I believe there would be people alive today if there were a death penalty. 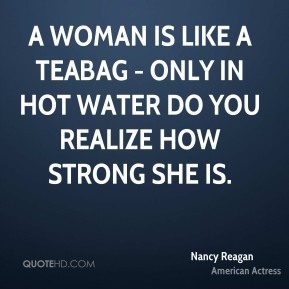 A woman is like a teabag - only in hot water do you realize how strong she is. 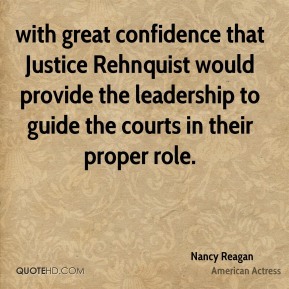 with great confidence that Justice Rehnquist would provide the leadership to guide the courts in their proper role. 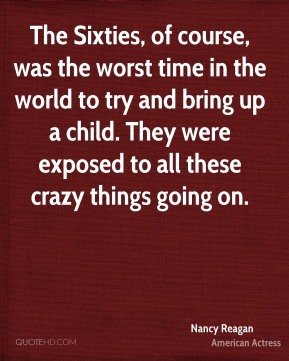 I don't think you can live in one [political] party. 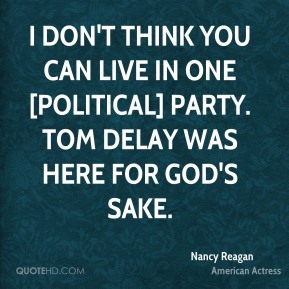 Tom DeLay was here for God's sake. 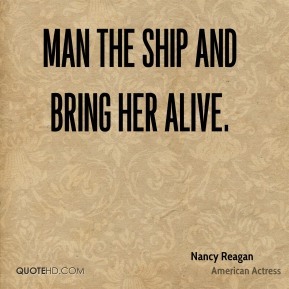 Man the ship and bring her alive. 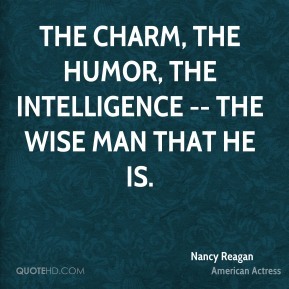 the charm, the humor, the intelligence -- the wise man that he is. 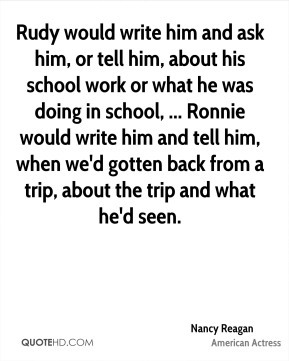 Rudy would write him and ask him, or tell him, about his school work or what he was doing in school, ... Ronnie would write him and tell him, when we'd gotten back from a trip, about the trip and what he'd seen. 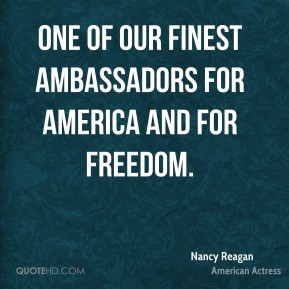 one of our finest ambassadors for America and for freedom. 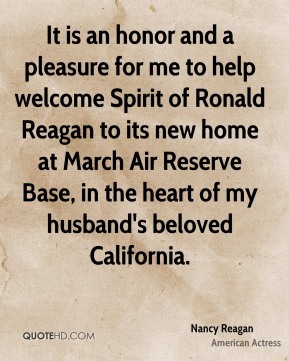 It is an honor and a pleasure for me to help welcome Spirit of Ronald Reagan to its new home at March Air Reserve Base, in the heart of my husband's beloved California. 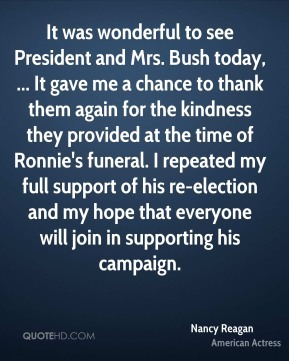 It was wonderful to see President and Mrs. Bush today, ... 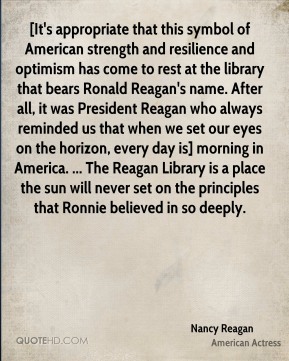 It gave me a chance to thank them again for the kindness they provided at the time of Ronnie's funeral. 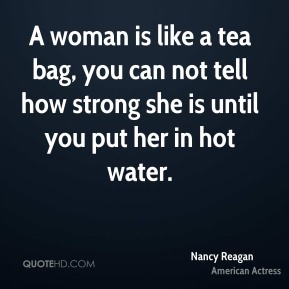 I repeated my full support of his re-election and my hope that everyone will join in supporting his campaign. 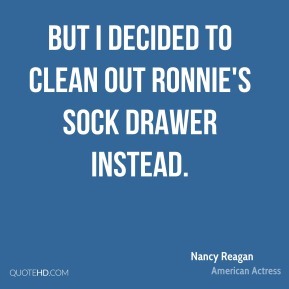 But I decided to clean out Ronnie's sock drawer instead. 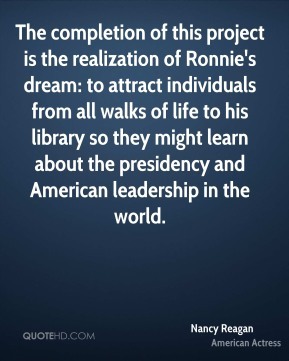 The completion of this project is the realization of Ronnie's dream: to attract individuals from all walks of life to his library so they might learn about the presidency and American leadership in the world. 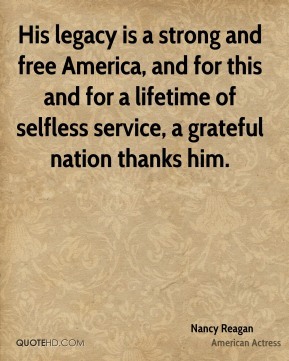 His legacy is a strong and free America, and for this and for a lifetime of selfless service, a grateful nation thanks him.